Due to increased activity in the building sector over the last decade or so, Local Authorities have laid down strict guidelines for developers, who wish to construct new projects on existing non-developed land. No longer can collected stormwater be discharged openly into the existing drainage network. All developments of scale, now have to contain their stormwater on site and slowly release it to the drainage network, at a controlled rate. 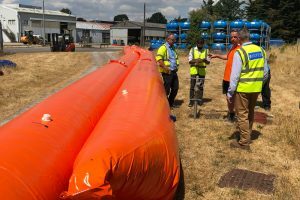 To facilitate this, Geoline Ltd. has partnered up with a UK manufacturer called ESS Ltd. (Environmental Sustainable Solutions Ltd.) to manufacture and install underground stormwater storage tanks. 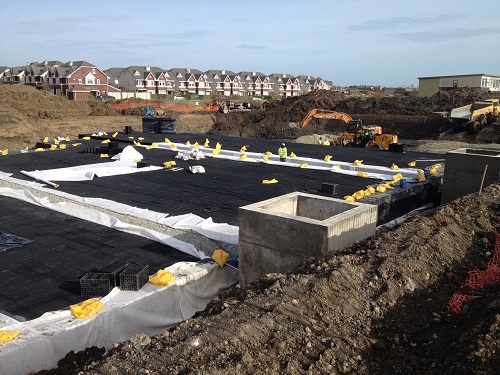 Underground tanks are particularly of interest on development sites where space is limited and where ever m2 of land is valuable. 3. 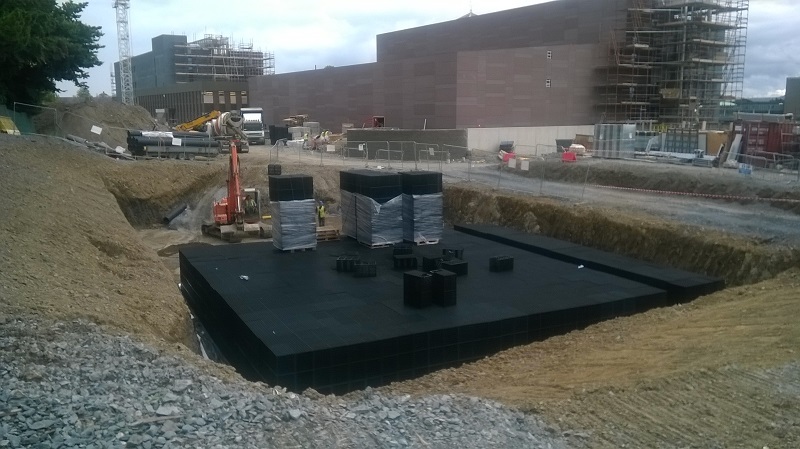 The Modular Blocks, Liner Materials, Pipework and Supply Flow Control Unit will be delivered to your site, where we will complete the excavation and construction, and installation process for you. 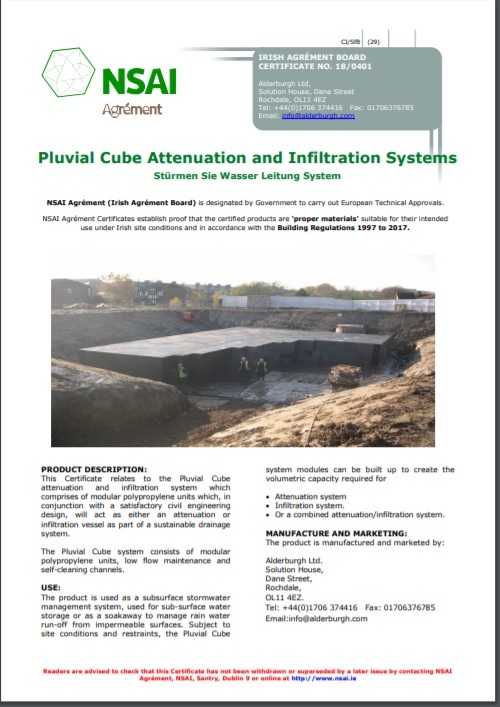 NSAI Agrément Status achieved for Geoline Ltd. & ESS Ltd.
Pluvial Cube Attenuation and Infiltration Systems. 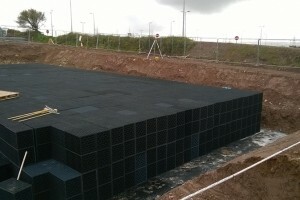 – Geoline Ltd. is the Sole Supplier of Attenuation Storm Water Tank Materials to this standard in Ireland. 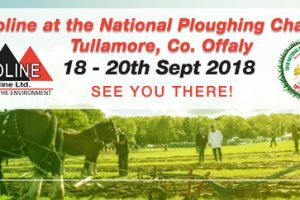 – NSAI Agrément Status(Irish Agrément Board) is designated by Government to carry out European Technical Approvals. 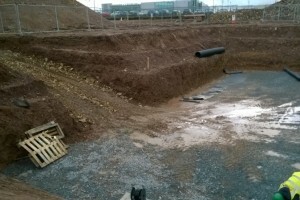 Main Contractor will excavate hole to accommodate the ESS Ecocell Tank to dimensions given by Geoline. All tanks require a minimum of 500mm of over-dig on all 4 sides. 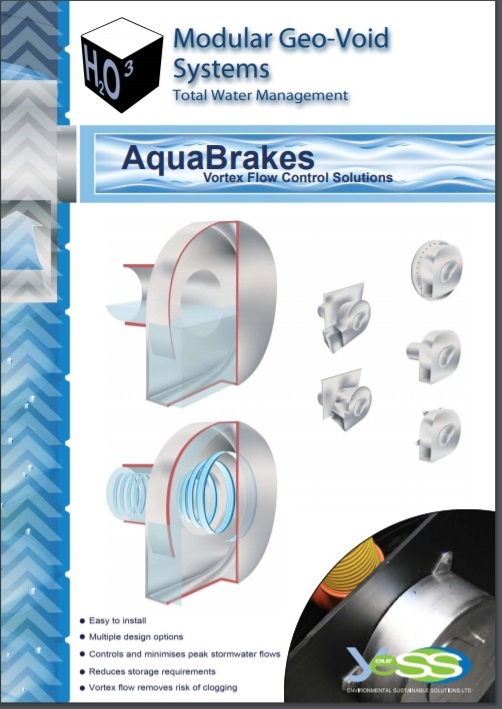 This is required to allow Geoline access to seal the sides / corners of the tank and it is necessary to allow for proper placement and compaction of backfill to the sides of the tank. Base of the excavation to be blinded with 50mm of Limestone Quarry dust or Clause 804 and compacted with a ride-on-roller to achieve a firm flat surface. 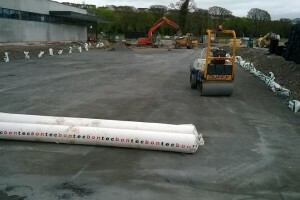 CBR of ground to be approved by Clients Engineer. 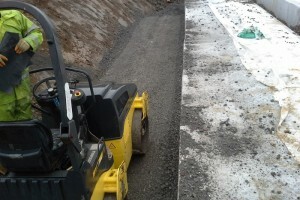 An access ramp is required in one end of the excavation to allow access to the base of the tank for a teleporter. The teleporter will transport the pallets of Ecocell Blocks from the delivery trucks to the Geoline installation crew inside the excavation. 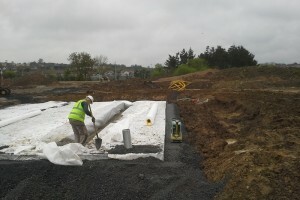 Geoline’s site team will cover the prepared base with a heavy-duty non-woven protection geotextile. 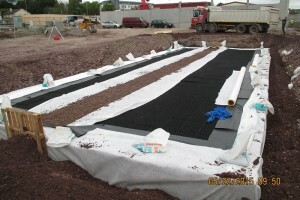 Next they will cover the protection geotextile with a prefabricated and pre-tested geomembrane liner panel. This liner will create the overall seal to the Ecocell Tank. The overall panel dimensions allow for the panel to be extended up the sides of the tank and onto the roof, above top water level. 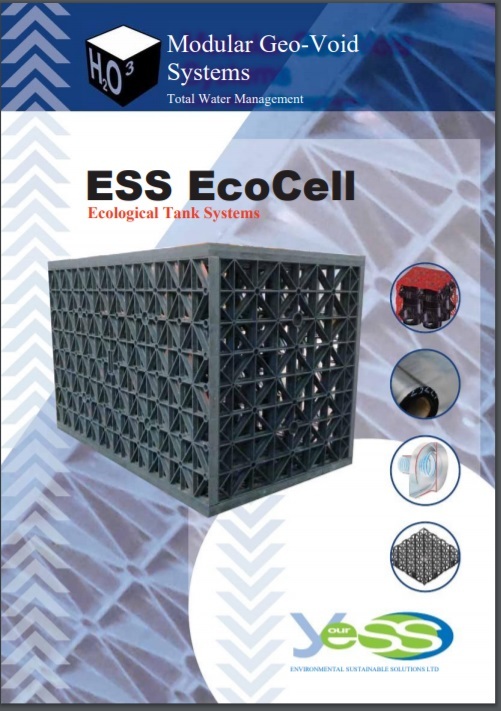 The ESS Ecocell Blocks are then positioned on the base to form the overall dimensions of the Stormwater Attenuation Tank. 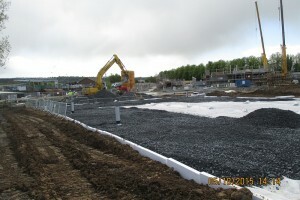 A central pathway is left out for the installation of the central distribution pipework and accompanying drainage stone. This pipework is sealed to the geomembrane liner at the inlet and outlet points and surrounded by a concrete thrust block for strength. The central distribution pipe is wrapped in a special hi-flow geotextile filter fabric, that prevents silt from entering the tank. This fabric is washed on each emptying cycle of the tank, thus removing any risk of silt build-up in the tank. The distribution pipe is then surrounded in 2” clean, washed round drainage stone, until it is flush with the roof of the tank. Air vents are then installed in the roof of the tank and the tank is finally sealed with a roof liner panel and protection geotextile overlay. 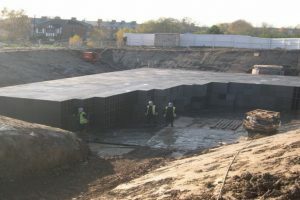 The Main Contractor must first backfill all four sides of the Ecocell tank with Clause 804 or other approved backfill material, compacted in 450mm layers by vibrating plate or ride-on-roller. 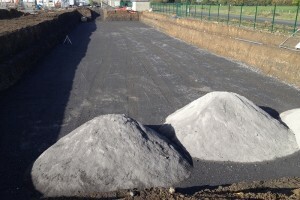 The backfill must be taken up to roof level on all 4 sides before any backfill on the roof can take place. 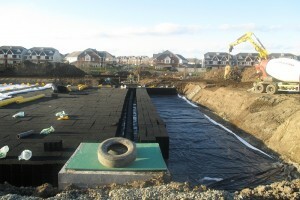 A minimum of 500 – 650mm* of approved backfill material must be placed on the roof of the tank, depending on location, whether under green area or under roadway. Consult ESS Ltd. for guidance.